Ampersand’s white paper, The Risk Contribution of Stocks, clearly illustrates the riskiness of stocks; a value that escalates when volatility increases. While most investors believe that a 60/40 stock/bond portfolio is well diversified, they are mistaken. Ampersand analyzed the volatility of stocks and bonds over a 41-year period (1975-2016). 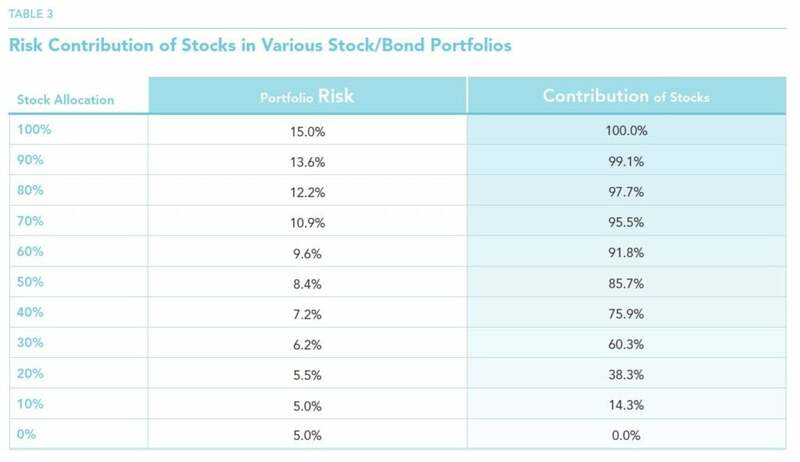 They constructed a 60/40 stock/bond portfolio and found that the risk contribution of stocks is a whopping 92%. An 80/20 stock/bond portfolio is even riskier, with stocks accounting for 98% of the risk. 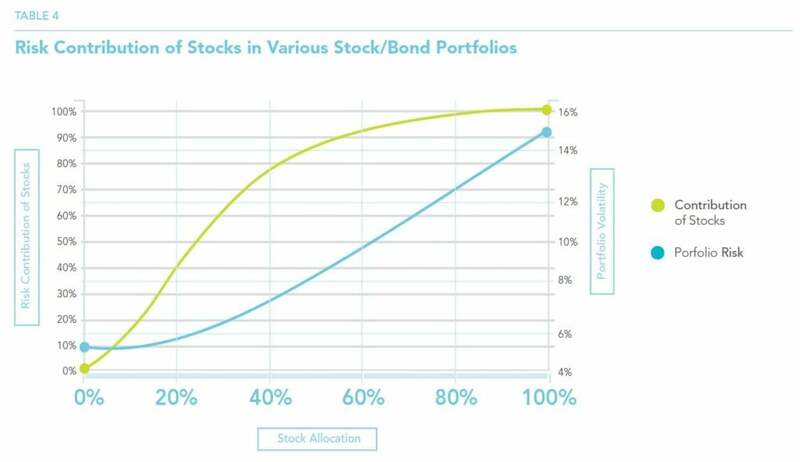 In a 40/60 stock/bond portfolio, 76% of the risk still comes from stocks, and even a portfolio with as little as 20% allocated to stocks derives almost 40% of its risk from stocks. Nonetheless investors continue to hold significant positions in stocks because of the expected higher returns. Examining the total risk of various hypothetical stock/bond/managed futures portfolios reveals that the portfolio with the lowest risk is 80/20 bonds/managed futures (zero stocks). However, this portfolio also has the lowest expected return. Creating an optimal portfolio requires a closer look at Sharpe Ratios, the measure of how much “risk premium” a portfolio earns per unit of risk it takes. All else equal, a higher Sharpe Ratio implies a more desirable portfolio. Analyzing the Sharpe Ratios for various portfolios, the portfolio with the highest Sharpe Ratio (0.95) turns out to be a 20/50/30 stock/bond/managed futures portfolio. This portfolio showed the highest reward-to-risk ratio and could be considered the optimal allocation strategy. A closer look reveals that in this 20/50/30 stock/bond/managed futures portfolio, all three asset classes contribute almost equally to the risk of the portfolio – sometimes referred to as a risk parity portfolio. According to Modern Portfolio Theory, the portfolio with the highest Sharpe ratio, where risk contributions are spread out across the component assets classes, is also called a “tangency portfolio” and is considered the optimal portfolio for all investors. Each investor can combine this “tangency portfolio” with risk-free lending or borrowing which provides an appropriate, customized level of risk while maintaining a high Sharpe Ratio. For example, risk-averse investors can combine the “tangency portfolio” with risk-free lending to dilute their risk. This risk averse investor can invest 50% in the “tangency portfolio” and the other 50% in T-Bills, thereby reducing the risk while maintaining good performance. For risk-tolerant investors, they can borrow at the risk-free rate and leverage the portfolio which boosts both the risk and the returns. These tangency portfolio strategies are constrained, however, because all allocations, even when borrowing or lending, sum up to 100%. What happens if the constraint is relaxed and the allocations go beyond 100%? This idea is called “extended diversification” and is very powerful. “Extended diversification” allows investors to potentially harness the combined benefit of their current portfolio and add an allocation to managed futures. Traditionally this has been an either/ OR decision which involves selling part of an existing stock or bond portfolio and adding exposure to a diversifying asset class such as managed futures in place of the stocks and bonds. The portion allocated to the diversifier (managed futures) forces an investor to choose between stocks and bonds OR managed futures. In the end, however, this OR decision may result in giving up the returns that the relinquished stocks and bonds might have continued to earn. The good news is, there is now another choice in the world of “extended diversification” that allows investors to hold on to their stocks and bonds AND allocate to managed futures without the opportunity cost of selling any stocks and bonds. So, how does this new idea of AND versus OR work? Stay tuned for the next Ampersand white paper which will reveal the power of AND. Most investors tend to believe that stocks are a good-perhaps even the best—investment in the long run. However, the reason for expecting good performance from stocks is perhaps not always clearly articulated: Quite simply, it is because they are risky. For an investor in the US, US Government debt is generally viewed as being risk-free, if we ignore inflation risk. This investor would rank investment-grade senior corporate debt as slightly more risky than Treasury bonds (with AAArated debt viewed as less risky than AA, followed by A, and so on). Next in the hierarchy would come subordinated debt, preferred stock, and common stock would bring up the rear. The reason stocks are the riskiest investment is that they are at the bottom of the pecking order in terms of their claim on the company’s profit or cash flow. But the reason they can also be the most rewarding is that they are entitled to all residual profits, after paying off the other more senior claims in the corporate capital structure. We do not know how volatile stocks and bonds will be in the future. We could use historical volatility as a projection, but the realized volatility of any asset depends on both the time period and the horizon over which it is measured. We therefore make some assumptions that are based on the realized values for the period 1975-2016 (the point we are trying to make here does not depend on the exact assumptions). In Table 1, we illustrate the assumed volatilities for stocks and bonds, and also the assumed correlation between them. We denote volatility with the Greek letter (sigma) and use subscripts ‘s’ and ‘b’ for stocks and bonds, respectively. The correlation is denoted by the Greek letter ρ (rho), with both ‘s’ and ‘b’ as subscripts, denoting that this is the correlation coefficient between stocks and bonds. In order to analyze how much of the risk of a stock-bond portfolio comes from each of its components, we need to understand how the volatility of a portfolio is calculated. Table 2 illustrates the formulas behind the calculations. the “co-risk” of bonds and stocks. The risk of stocks alone is given by the squared value of the allocation to stocks (60% in our example) multiplied by the squared valued of the risk of stocks (assumed to be 15%). This value turns out to be 0.00810. The risk of bonds alone is given by the squared value of the allocation to bonds (40% in our example) multiplied by the squared valued of the risk of bonds (assumed to be 5%). This value is 0.00040. The “co-risk” of stocks and bonds is given by the product of five quantities: the allocation to stocks, the allocation to bonds, the risk of stocks, the risk of bonds, and the correlation between stocks and bonds. This is equal to 0.00036. The “co-risk” of bonds and stocks, by symmetry, is also 0.00036. What is the contribution of each component? The risk of stocks alone plus the shared risk of stocks and bonds is 0.00846, which is 91.8% of the total squared risk, which is 0.00922. Thus, stocks contribute almost 92% of the portfolio’s risk, while bonds contribute the remaining 8.2%! Upon reflection, perhaps this should not be a surprising result. The risk of stocks is three times as high as bonds (15% vs. 5%), and the allocation to stocks is 1.50 times the bond allocation (60% vs. 40%). These two factors combined result in the high contribution of stocks to portfolio risk. Many investors mistakenly believe that a 60/40 stock/bond portfolio is “well diversified” relative to an all-stock portfolio. In fact, even though this may appear true given that the portfolio’s risk is only about 64% of the risk of stocks (9.6% vs. 15%), the fact remains that 92% of this lower total risk still comes from stocks. In going from an all-stock portfolio, where 100% of the risk comes from stocks, to a 60/40 portfolio, the risk contribution of stocks falls to about 92%. In Table 3, we show the corresponding result for other portfolios, ranging from all-stock to all-bond. The results are also depicted graphically.